The more I learn about nutrition in the medical system and the more I listen to doctors speak about their education and training the more I learn this to be true. Here is the curriculum to receive an MD from Harvard. You’ll see there are no courses in nutrition required to obtain a medical degree. I picked Harvard simply because of its reputation but you’ll find it’s more common than not to have nutrition courses as electives in MD programs and not requirements for a degree. Doctors have degrees in medicine, which is an incredible achievement and requires an unbelievable amount of knowledge about the human body. However, their education is, as a default, based on the practice of medicine, not nutrition. When it comes to nutrition they are, surprisingly, often just like you and me: laypeople. This may seem next to impossible that people who are experts on the human body don’t necessarily know anything about food but, due to the intense demands of their medical programs, there is little time left to study nutrition and its impact on health. Doctors often get a touch of basic nutrition information sprinkled into general health courses but it’s rare to have a MD program with core curriculum focusing on the importance of nutrition in human health. 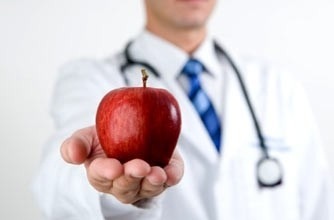 This leaves most doctors having to pursue nutritional education on their own and because of this, only a small percentage of doctors have spent the time, energy, effort and money to study nutrition and gain expertise in it. Because of this, as a general rule, you cannot expect or count on them to have a solid grasp of nutrition. Most of them have simply not had the time, opportunity or interest to commit to the massive undertaking it is to gather the expertise in the realm of good and nutrition. Just like some of us laypeople spend more time researching nutrition and have a better idea about it, a few doctors spend some time researching nutrition and have a better idea about it but, just as we can’t expect a dentist to be savvy and experienced in the field of nutrition (even though diet seems to matter a lot when it comes to the health of our teeth and mouth) and we cannot expect a criminal defense attorney to have an expert understanding of contract or patent legal work, we cannot expect doctors to have a default expertise in nutrition. So keep this in mind when you talk to a doctor about nutrition. You might or might not be talking to someone who knows what they’re talking about, just like when you talk to your cousin or your sister-in-law they might (or might not) know what they’re talking about. I hope there’s a higher likelihood of a doctor knowing more about nutrition than a relative but unfortunately you never know and I’ve heard enough doctors talk candidly about how little they knew about nutrition after going through med school that it makes me feel safe defaulting to assuming they don’t until they prove otherwise. Be an informed consumer/patient and do your research. It’s ok to ask a doctor about nutritional training or for a referral to someone who has specialized training. Pick their brain about different dietary topics and see if you like their viewpoint and approach to food. Traditionally, due to the complexity and individuality of nutrition, the more a doctor knows about food and diet the longer the conversation will be. As a side note: Naturopathic and Homeopathic physicians have had much more nutritional training and are believers in the importance of food in human health. Eat a low-fat, low salt diet with lots of whole grains while watching your saturated fat and cholesterol intake you can bet pretty good money they’re not well versed in the intricacies of nutrition. – Being a doctor on TV as a nutritional expert does not guarantee actual expertise (but means they’ve probably studied at least a little bit). – Being famous does not mean you know what you’re talking about in terms of anything, particularly nutrition. Being on Dr. Oz or writing a book does not necessarily mean you have expertise in the field of nutrition. Having a blog and writing about health does not necessarily mean you are an expert in nutrition. Myself included. I am not a nutritionist. I love the area of health and nutrition but that doesn’t mean I know everything. – I am certainly biased in this statement but I feel you’re actually more likely to get good nutritional advice from someone who hasn’t been taught in the medical system. – Nutritionists are specialists in the nutrition they were taught. This doesn’t mean they know everything or “the truth”, but that they have been taught nutrition based off someone’s curriculum/ideas/philosophy of nutrition. They have at least studied nutrition full time and exhaustively. My main concern is that they’ve become experts in nutritional conventional wisdom, which isn’t that great either. The bottom line is this: do not go to your doctor expecting an expert in nutrition. Go to your doctor for the practice of medicine. If you want an expert in nutrition then seek out someone who has the passion, time and energy to devote to learning the art and science of nutrition. If your doctor happens to be one of those people then count your blessings. P.S. If you’ve been to enough doctors and spoken to them about food and nutrition you know this to be true. Most have a general idea about the conventional wisdom of how to eat healthy but most cannot talk to you about the detailed intricacies of eating and how it impacts human physiology and health. You are so right! Too many physicians rely so much on medicine that they sometimes lose sight of simple non-medical fixes. I’m hoping that the work I put in now to understanding the biology of nutrition in medical school will pay off when I’m a physician in a few years; it’s something I’m definitely passionate about! Fantastic! I applaud you for your efforts, passion and dedication. I hope more and more people like you take on the challenge of taking the base of nutrition and human health and then build upon that with medical education because you will be the type physician that can really help people.